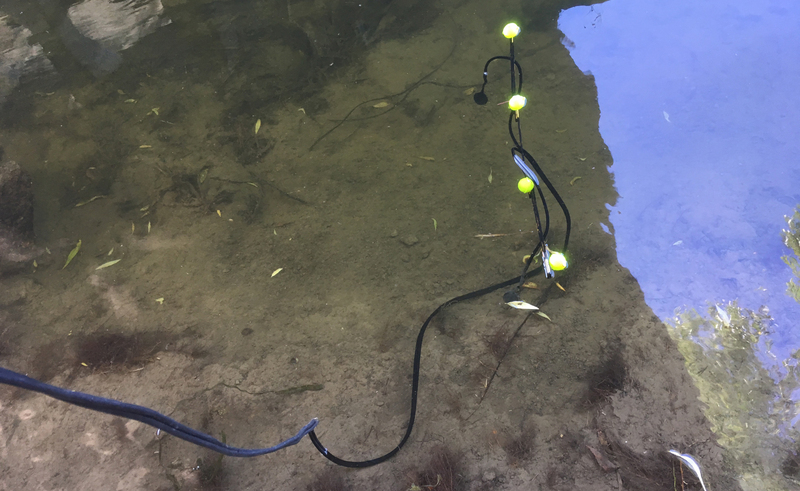 Finally this summer I was able to try out my hydrophones and contact mics outdoors, in making some field recordings in and beside a nearby river. I began with the hydrophones, which I described in the last post in this series. My experience with the 50mm piezo discs was that there was too much pickup from the cables and the wooden float structure in the bath, so I took the mics made from the 35mm discs. These worked fine in absolutely still water, but whenever there was the slightest wind or wave – which was virtually all the time – there was too much noise from the wind or water hitting the cables and the wooden float, so the wooden structure had to be discarded. I then turned to recording with the contact mics. The basic format of these, and the preamp I used, are described in this post, Pt 2 of this series. The difference in this case, though, was that the leads were attached to only one of the discs – I removed the leads from the other one as I had not experienced the same noise problems as I had with the hydrophones, and it wouldn’t therefore be necessary to have the double leads from each mic and the 4 channel balanced preamp which the hydrophone required. The preamp was not the same one I had used for the experiments in the posts referred to above – although it was similar. This time I used a standard inverting op amp amplifier. The resistor on the input was 1M and the resistor between the input and output was 10M, providing amplification of up to 10 times, but the output volume was controlled by a dual-gang 10k log potentiometer. I was intending to use my usual TL072 dual op amp, which is pretty low-noise and would have worked fine, but in the end used an NE5532 as I had just bought some of these and they are known for being especially low-noise. They are also a pin-for-pin replacement for the TL072. 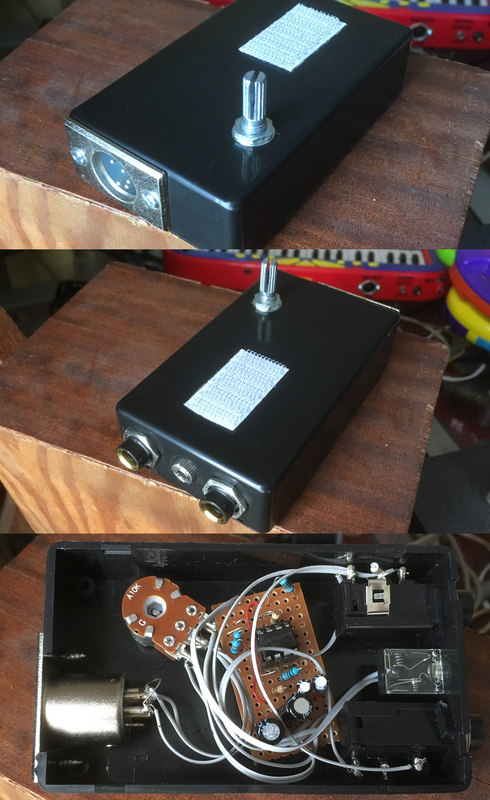 I enclosed the circuit in a small plastic box, very similar in appearance to the hydrophone preamp. This design was easy to hold in the hand and manipulate the volume control while monitoring with headphones. 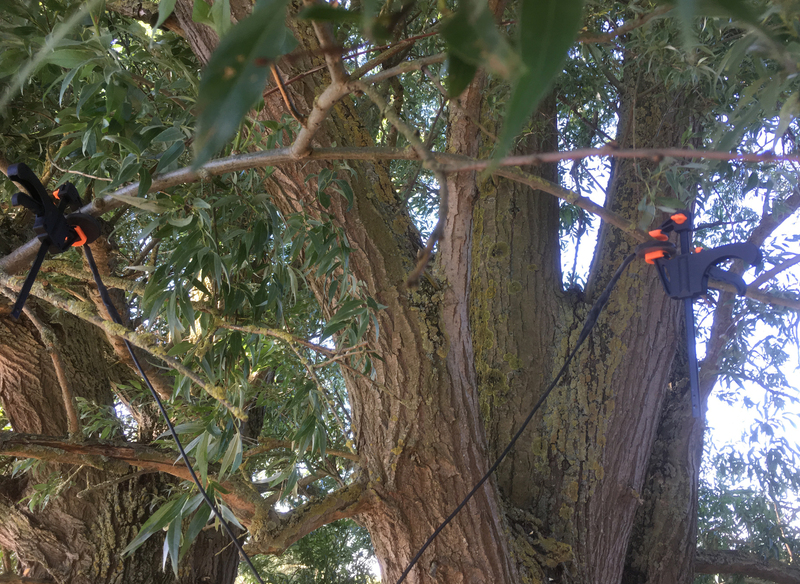 As previously mentioned, it was quite a windy day when I went out, so I attached the contact mics to tree branches to test them out – one mic would be near the end of the branch, the other one closer to the trunk. One disc would be held tight to the branch (the side to which the leads were attached), and the clamps pressed firmly onto the disc without leads. 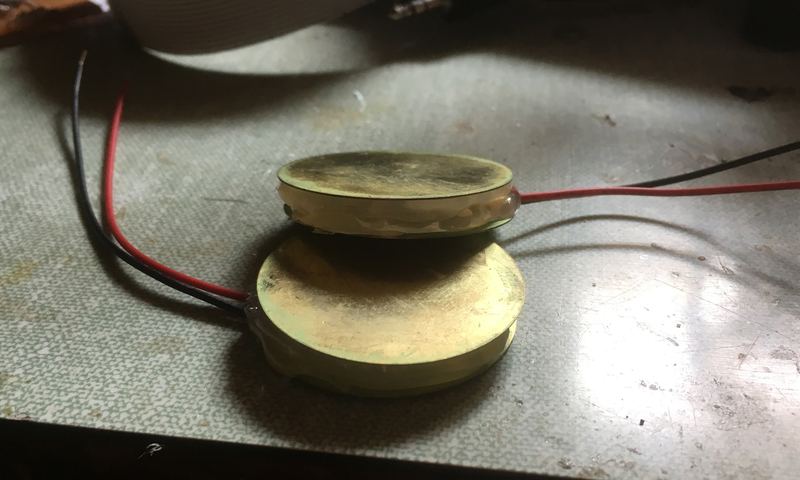 This side, of course, needn’t have been a piezo disc at all, but I used them because they were exactly the same size as the discs with the leads, and these particular discs were very inexpensive, so I didn’t feel it was too much of a waste of resources. If you didn’t want to use up piezo discs like this, you could use any fairly rigid substance – plastic or glass, for example – as long as it was roughly the size of the disc and wouldn’t deform when clipped or clamped. As I hoped, there was no distortion caused by pressure on the crystal layer, and the recordings came out well, capturing the movement of the trees in the wind. In my next post in this series, I’ll try out some improved methods of recording closer to where I want to in the water.